Item number Cb81 from the MOA: University of British Columbia. Off-white robe with green embroidery and purple lining. The man’s robe is made of plain weave cotton cloth, with double strips sewn together to give desired width. The front and back panels are sewn together along shoulder line, leaving a right angled opening for the neck. The panels are also sewn at the bottom corners, narrowing the leg opening. 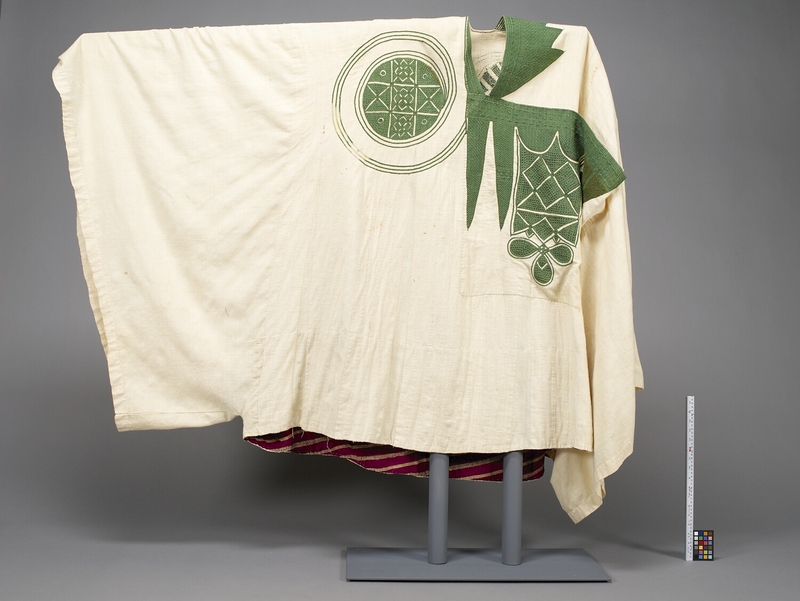 The front of the robe is embroidered with two designs in green cotton. The first design is of two downward pointing needles of solid embroidery with a complex cartouche-shaped motif. The second design is a pair of spiral circles enclosing a complex rounded motif. 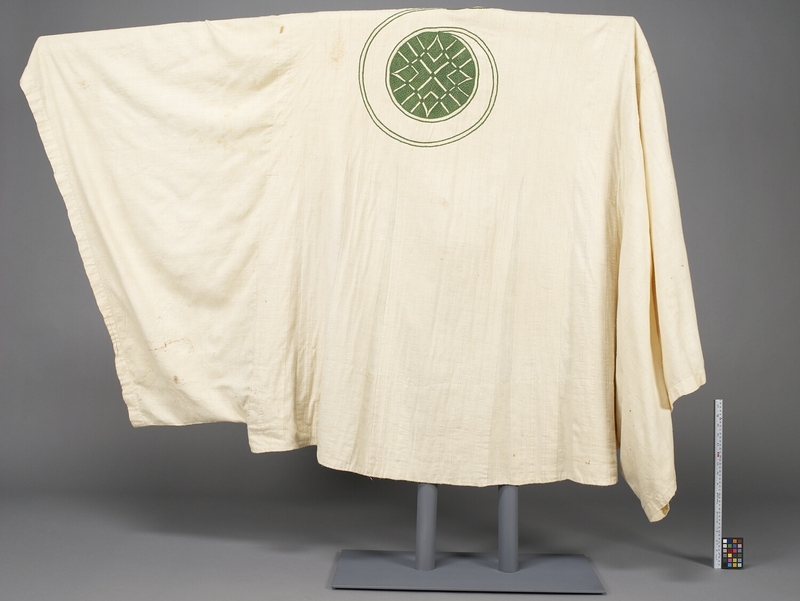 The back of the robe is embroidered with only the pair of spiral circles enclosing a complex rounded motif. The inside lining is bias cut purple and gold striped cloth. Man’s robe of honour. Typical Hausa style robe, where the extent of the embroidery reflects the prosperity of the wearer. The strips of cloth are woven by men on special men's looms and garments are generally tailored and embroidered by men as well. The design motifs, 'Dagi knots' etc., as well as the style and cut of the cloth, reflects Islamic influence in the area. Two-pointed knife (aska biyu) pattern. This is one of the complex embroidery motifs that has significance for Islam. These patterns are also seen in architecture, Koranic writings etc. While patterns are, in some sense, traditional they may be specially drawn out by Koranic scholars for particular use.